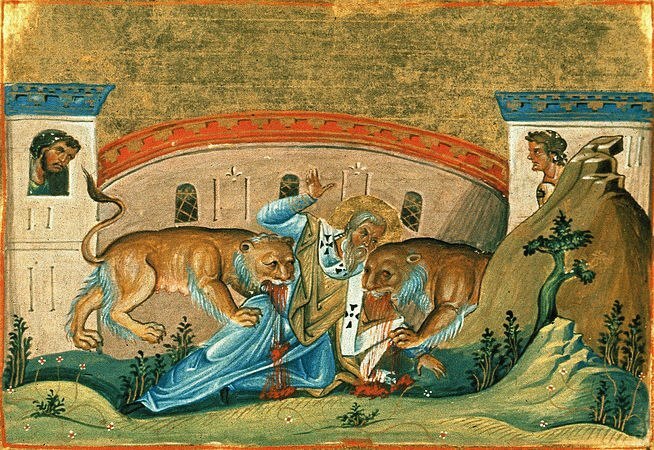 Although St Ignatius of Antioch is the Apostolic Father of whose writings we have the most, we know very little about him, less by far than we know about his contemporary St Polycarp. He is traditionally said to have been the child whom the Lord Himself “set in their midst and embraced” when He said “Whosoever shall receive one such child as this in my name, receiveth me.” (Mark 9, 35-36) This story certainly arose from his second name, which he gives at the beginning of each of his letters, misread as “Theóphoros – borne by God”, instead of “Theophóros – bearing God.” According to Eusebius, he was the second bishop of Antioch, after St Peter the Apostle and Evodius, and St John Chrysostom, who was a priest of Antioch before his election to the see of Constantinople, and thus conversant with the traditions of the city, says that Ignatius was ordained by the Apostle himself. We do not have an authentic eyewitness account of his martyrdom. The seven letters of his which survive were written while he was on his way to Rome to be martyred, but the purported accounts of his trial before the Emperor Trajan, and of his condemnation and death, have long been recognized as later works and unreliable. St Jerome, who was very familiar with both Rome and Antioch, says that he was thrown to the wild beasts, a standard punishment for Christians who were not Roman citizens; hence the classic representation of St Ignatius between two lions. The tradition that this happened in the Roman Colosseum, while perfectly plausible, is attested by no direct evidence, and may have arisen from the fact some relics of him have long been kept in the nearby basilica of St Clement. The revised version of Butler’s Lives of the Saints rightly notes that “(t)he obscurity which surrounds almost all the details of this great martyr’s career is in marked contrast to the certainty with which scholarship now affirms the genuineness of the seven letters…” “Now” refers to the controversy, which raged for centuries, over the authenticity of the letters, the oldest recension of which contains a number of obvious interpolations, probably made by Apollinarian heretics at the beginning of the fifth century, and six other completely spurious letters. In the past, some scholars took this as a pretext to reject the entire Ignatian corpus as spurious; one 17th century Calvinist scholar even went so far as to join the question of their authenticity with that of the most famous pious forgery in the history of theology, the writings attributed to Denys the Areopagite. When Donald Attwater published the revised Butler’s Lives in 1954, he could rightly say that “the dispute is now practically settled”, with the recognition as authentic of the letters to the Ephesians, Magnesians, Trallians, Romans, Philadelphians, Smyrnaeans, and St Polycarp, according to the list given by both Eusebius of Caesarea and St Jerome. The date of his death is also unknown, and the subject of much confusion. His traditional feast day in the Roman Rite is February 1st, a date also given in some early Martyrologies, but December 20th in the Byzantine; the Syrian church keeps it on October 17th, the day to which his feast was moved in the post-Conciliar reform of the Roman Calendar. Chrysostom and Jerome both attest that his relics were at Antioch in the later 4th century, the former stating in a sermon on his feast day that Rome had received his blood, while Antioch now cherished his relics, the latter that they were kept “in the cemetery outside the Daphne gate at Antioch.” This would mean they were first brought there from Rome, and then back again, but the reasons for these two translations, their dates, and their connection with the date of his feast in various traditions are also far from clear. Adding to the confusion is the odd coincidence that the Byzantine liturgy celebrates the translation of his relics on January 29th, three days before his Roman feast, while the Roman Martyrology notes the translation on December 17th, three days before his Byzantine feast. Notwithstanding the fact that he is named in Canon of the Roman Mass, his feast is not mentioned in any of the early sacramentaries or lectionaries, and was only established at Rome in the 12th century. The Blessed Schuster says that this is obviously because his tomb was not at Rome, but neither are those of many other Saints named in the Canon, such as Cyprian, Cosmas and Damian, and Agatha, whose feasts are attested in early Roman liturgical books. February 1st is exactly two weeks after the feast of St Peter’s Chair at Rome on January 18th, and three before the Chair at Antioch on February 22nd, which, considering that Ignatius was a successor of St Peter as bishop of Antioch, and martyred at Rome, makes for a tantalizing coincidence. However, this can be no more than coincidence, since the keeping of both feasts of St Peter’s Chair is an innovation of the 16th century.